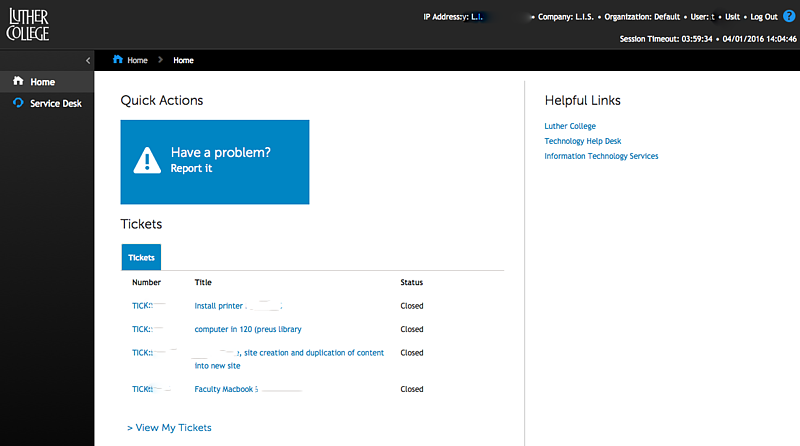 Enter, view, and update your tickets using the interface at http://help.luther.edu. This self-service option allows you to view detailed information about the work being done on your requests, both new and old, as well as create new tickets. Note that you can still contact the Technology Help Desk via email ([email protected]), phone (563-387-1000), or by visiting the library (hours). 1. Go to http://help.luther.edu and sign in with your Norse Key. 2. Once you’ve successfully logged in, you will see the following window. Click the blue button that says Have a problem? Report it. This queue is for general technology requests or issues. Please be sure to fill out the Impact field. This queue is for assistance with your Luther website pages in Reason. Please be sure to fill out the Website URL field of the page or site to which the request is referring. This queue is for sending email communications on behalf of Luther College departments, offices, and organizations. Please be sure to fill out the Use Existing Constant Contact Account field; this tells us whether or not you already have a Constant Contact account with Luther. If you select yes, you will be asked to select your account name/department and whether or not to use an existing template from previous communications. Put the intended recipients in the Comment field. Attach a Microsoft Word file that contains your e-mail content. The document should be formatted as you would like it to appear to recipients. On the right side of the window you will find “Ticket Notes.” This is a key to understanding the fields necessary to completing the ticket. 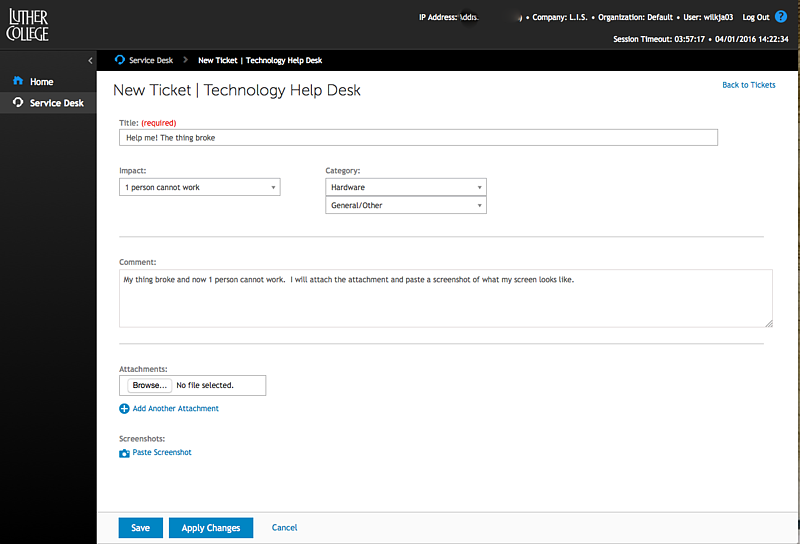 The status of a new ticket will automatically be set to “New.” It will remain this way until a Technology Help Desk employee looks at the ticket and switches it to the appropriate status. 5. Once you’ve filled out all of the fields a successfully entered ticket will look like the following. Click Save. Clicking Save submits your request. No further action is needed. You will receive an e-mail confirmation of your submitted ticket. 2. 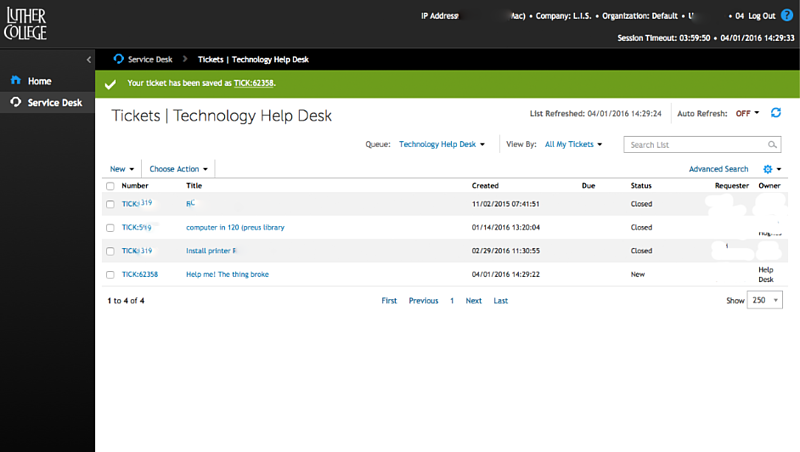 Each time you log in, you will be shown all of your tickets under the Technology Help Desk queue. If you wish to view tickets in the Web Content Requests or Email Marketing Project Requests queues instead, click the My Tickets drop down menu, roll over Switch to queue and select whichever option you would like to view. To allow all tickets from all three queues to be shown on one page, you must select the All Tickets option from the drop down menu. 3. Click on the Ticket Number or Title to view the details of the ticket. 4. If the ticket you’re wanting does not appear on the initial page, you can look for specific tickets using the Search box on the right side of the screen. Options that will help you narrow your search are the Ticket Number, Title, date and time Created, Due Date, Status, Requester, or Owner. If you aren’t satisfied with the results from the standard search, clicking on Advanced Search will help you strengthen the chance of finding what you are looking for. 1. - 3. Follow the steps outlined above to find your desired ticket. 5. Enter additional information regarding the ticket, attach a file, or add a screenshot to the ticket. 6. Click Submit underneath the comment box. After the Submit button goes grey you should be able to view your comment in an area underneath the comment box.